This Tree guides you in refusing to give up so as to make your project succeed and produce achievement following severe failure. Note: The main Certainty level in this emergent framework appears to be KL6: Formation because everything depends on asserting your autonomy to make changes and so separate yourself from others who would give up. It may help to read this part first. There appears to be a move from an abstract perspective on reality down to a practical drive for tangible engagement with events. The two extreme Centres seem externally-oriented: at the top (KL7) you make yourself dependent, at the bottom (KL1) you make yourself self-reliant. The other two Centres seem internally oriented: the upper (KL4) provides a continuity, the lower (KL2) provides an adaptability. procedures-KL1 that you activate must suit the situation and activate others as well. The three vertical Channels also show a progression: moving down from challenging (KL7 ↔ KL4) through energizing (KL4 ↔ KL2) to confirming (KL2 ↔ KL1). Signals are specific messages with an unambiguous meaning. Signals may be emitted by yourself (e.g. your physical or mental state, repetitive thoughts), or evident in your environment. They may come from close at hand (e.g. family, co-workers, helpers &c) or from the wider context (e.g. new enabling technology, new legislation &c). Ignoring an unambiguous message is a mistake. Those messages must lead to changes that make a difference. Because signals are unambiguous they are a prime source of certainty. However, a dispassionate selfless attention is essential because the message may frustrate personal wishes or disrupt expectations. If signals do not get the necessary respect, they are rationalized away or denied, and soon get lost in the myriad of difficulties that the project faces. Signals may also be missed or misunderstood through lack of attention. Whatever the cause, missed signals mean your energies get misdirected. Meanwhile others, who are dispassionate, see the signal all too clearly and are likely to lose confidence in you and your project. When is a signal a signal? Signals are part of communication-PH5 where understanding is the critical requirement. You should be able to conclude whether or not a particular event or series of events is a signal (rather than a sign or symbol or 'just one of those things'). For example, receiving a rejection is almost invariably unpleasant, but is it a signal that your offer is poor, wrong or bad? Sometimes it is and sometimes it isn't e.g. in publishing, numerous best-sellers have been turned down repeatedly before finally being accepted. Respect for signals allows you to focus self-imposed changes-KL6Y, and demands that you create situational modifications-KL6S. Signals will also challenge your beliefs-KL4B. To succeed, you must not just believe in yourself, in your project, and in your approach, but feel good about it. In the present situation where there is usually social opposition, you must also believe in the value of what you are attempting for others outside your inner circle: your community, customers, wider society, even humanity. This feel-good believing must not be blind or self-serving. It is after all a form of willingness. Rather you must expose and explore your beliefs: question them, check them, investigate them, debate them. Only if your beliefs go through the fire of calm reflection, intense scrutiny and relevant criticism are they worthy of making you feel good, and capable of providing enough certainty to make success likely. Your intense belief is also fundamental to your well-being and the well-being of others who become involved in your project (e.g. as supporters, workers, investors). Just because you believe, does not mean others have to agree or understand why. But your unwavering belief provides an absolutely vital sense of comfort and confidence for those who associate themselves with your project. Many people have irrational beliefs based on childhood experiences. These ideas may be inappropriate and grandiose, but mostly they are about being incapable, unloved or unwanted. They commonly focus on irrational fears about others or possible consequences. This is the opposite of feeling good. If such beliefs intrude, they deserve to be properly explored and reflected upon, but then they can and should be dismissed. That is not to say you stop feeling you are always doing the wrong thing (a feeling you have probably had since childhood), you simply don't regard that belief as relevant to the project in hand. It is more difficult if you have a tendency to pessimism (which you call realism), because others may misconstrue this. Believing commits you to impose changes on yourself-KL6Y, and it gets support from the new environment-KL6S that you create. Believing requires you to become realistic about the project concepts-KL5Y, and it gets acceptance through your appreciation of outsiders' concepts-KL5S. 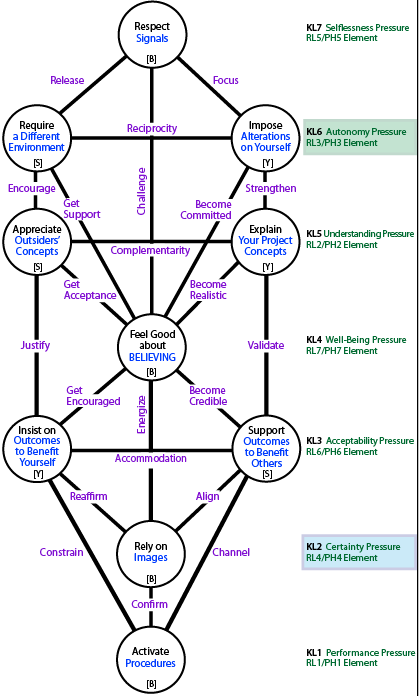 Feeling good via beliefs is powerfully boosted by your promotion of benefits from the project's outcomes-KL3: benefiting others-KL3S develops credibility, while benefiting yourself-KL3Y is encouraging. As you look for guidance, your beliefs challenge signals-KL7B, and in looking for effects, they energize your vision-KL2B. The project must come alive in terms of images of all sorts because they are the most intense generator of certainty in eventual success. It is not just a vision in the sense of a goal or value, but an intense experience. You need images for how the project is going to proceed, how the outcomes will look, how the benefits will spread. You should picture yourself already achieving results, and visualize getting the job done. You need images of what others will or could do. Although these are your images or at least you are primarily responsible for evoking them, others must be able to see them in their own mind's eye as well. It is usually helpful to produce graphs, block diagrams, 3D models, or take photographs. However, note that a photograph that is simply symbolic (e.g. a sunrise representing a new beginning) may be unhelpful because it's lack of concreteness confuses supporters and sows distrust in sceptics. Images that you rely on will energize your beliefs-KL4B. They should reaffirm those outcomes identified for yourself-KL3Y, and be aligned with support for outcomes benefiting others-KL3S . They must confirm (and be confirmed by) the easy-to-envisage procedures-KL1B. The key mechanism here is vision: effective leaders demonstrate the confidence to present a vision despite doubt, confusion and fear around them—and this is widely regarded as needed for successful group achievement. See more. Note that this Centre contains the certainty element (PH-L2) at the certainty level (KL2) in the Tree. Given the likelihood or expectation of failure, it is not possible to have full confidence the effective action will accord with plans and schedules. Much greater certainty comes from following procedures. But these steps should only be activated when the time is right or success will be unlikely or even wasted. Procedures contains steps that can be visualized. So the channel between procedures and images should be open and provide confirmation that you are on the right track (or you get early warning of trouble). They channel (and are channeled by) outcomes benefiting others-KL3S, and constrain (and are constrained by) outcomes benefiting yourself-KL3Y. What if the procedures fail to deliver what you expect? That would be a direct blow to your certainty and confidence, and will surely undermine the support from others. It suggests that something is seriously wrong with your capacity to manage an implementation of a simple sort with well-understood expectations. It might suggest faults higher in the system e.g. in the promised outcomes, in your concepts, or even in a crucial belief. Most seriously, perhaps you ignored signals that were flashing red or avoided necessary contextual changes. You have to take up a new position in regard to your project. That means autonomously instituting changes that you alone are responsible for. You believe in the project so that does not need significant alteration. However, given that others do not support it or you, and failures to date are not encouraging, something is obviously going wrong. Your independence of mind and readiness to assert yourself in the face of opposition and evidence is therefore fundamental. You must determine what alterations are called for to bring you centre-stage and get others on board. As you are part of your situation, there needs to be some reciprocity between what you impose on yourself and what you now require of the situation. Your project now depends more than ever on you—especially how you conduct and present yourself. There is a need for a greater identification with your project and that certainly means changes to your life: perhaps to your work arrangements, to your daily schedule and time management, to certain relationships, to attitudes, to existing financial commitments. Such changes are up to you to determine, to insist on and to make, but some may have to be evident to others as part of winning them over. They must not threaten to destabilize you. Self-imposed personal changes ensure and show that you become committed to your beliefs-KL4B. They also strengthen your explanations of project concepts-KL5Y; and, because they put the project above your convenience, they help you focus respect for signals-KL7B. You project operates within an environment that includes factors that affect success. It is typically essential to alter that social situation. While you cannot control your environment, you can decide for yourself what changes are required, and then create them opportunistically. Some changes will be intrinsic to the endeavour-proper (e.g. altering suppliers, changing recruitment), while others are contextual (e.g. altering the form of project ownership, moving the location of work). Your changes may be referred to as improvements, but the effort here is to modify rather than to improve. As with changes you impose on yourself, the project itself is regarded as adequate. It just needs new forms that give it a chance to get off the ground. How and what you create as the new environment must demand respect for signals-KL7B, encourage appreciation of outsiders' concepts-KL5S, and support your beliefs-KL4B. Others will wonder what your project is about. So you need to go back to the project ideas and extract those concepts that define it. You should do this for yourself as well as for others. Only if you understand thoroughly, can you be certain. Certainty in understanding also lets you explain what you are attempting in a clear pithy way. Your explanations of your own project necessarily influence what others think, but the reverse should also hold. While the two perspectives differ, there should be a complementarity. Note that concepts differ from outcomes. Concepts-KL5 are an essence of the whole, necessarily more abstract and general than the tangible and often conventional benefits intrinsic to strategic objectives-KL3 e.g. Henry Ford's revolutionary concepts were "a car for the middle classes" "mass production" "consumerism", while his outcomes were usual and desirable: "cheapness" "reliability" "profitability". Your explanations of project concepts help to ensure beliefs-KL4 become realistic. They validate your support for outcomes benefiting others-KL3S, and strengthen the changes you impose on yourself-KL5Y. Is the Concept Enough? Developing a project demands far more detail than just the concept. But that is a matter for the endeavour-proper. All those details of that endeavour are crucial to sustaining an intelligent belief in the project. They require clarification and articulation, but they do not belong in these Centres. It is common to find that people can go into great detail about project activities while being unable to explain in simple terms what is special about their project. Outsiders will have their own concept of your project, one that makes sense to them or is what they hope for and expect. By discussing and exploring, you can discover what this is. Your appreciation of these ideas must fit with your personal concept. In the examples, above, the outsider concepts might be in (a) making clothes last longer—which may be a long way down your list of priorities; and in (b) usefulness in advertising—something you may find distasteful. Appreciating outsiders' concepts encourages your creation of environmental changes-KL6S, helps in getting acceptance of your beliefs-KL4B, and should justify the benefits-KL3Y you aim to gain for yourself. The project needs desirable feasible outcomes that maximize impact (i.e. strategic objectives). These are the rationale for persevering with a project that seems to many wrong-headed, doomed or impossible. In refusing to give up, you must identify and promote those outcomes. Their acceptability will give you certainty. However, there must also be outcomes that make your own effort worthwhile. Again the criterion is acceptability to yourself. Supporting benefit for others must take into consideration benefit for yourself, and vice versa; but value for others must come first. You must be certain and precise about how others are going to tangibly benefit from the successful execution of your project. The more revolutionary the project, the greater the orientation to benefit many, either within a community, or sometimes for a much wider society or even globally. These outcomes for others provide credibility for your beliefs-KL4B, and validate your explanation of project concepts-KL5Y. They should align with images that you visualize-KL2B, and channel procedures-KL1B chosen to give confidence about successful progress. Even if you are motivated by your commitment to the project and your beliefs, you must get something tangible from it as well. It is not enough to be proved right: because you know that already. You must therefore insist that successful execution of your project should bring you a financial reward, or get you a promotion or public fame, or something else that is equally concrete. Outcomes benefiting yourself encourage you to keep believing-KL4. Your insistence on them also reaffirms the relevant images-KL2, and constrains the choice and timing of procedures-KL1. Continue to Bypassing Others' Resistances: the Tree of PH-L3s from PH7-Willingness that helps you establish your ideas as sound.